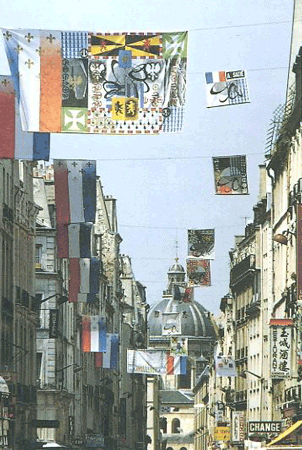 1989, From Rousseau to Isou, the novel of the bicentenary of the French revolution was unveiled in the context of the festival for the bicentenary of the revolution in Paris (Place de l'Od�on, Rue de l'Ancienne Com�die, Rue Dauphine). Presentation of the first verified novel in the street that Isidore Isou had developed in 1961, but that had never before been made a reality. 30 drapeaux de 100 x 75 cm. et 4 drapeaux de 300 x 160 cm.